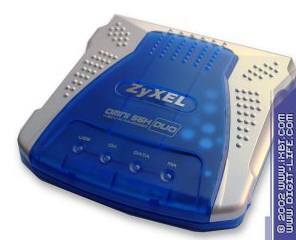 Not so long ago ZyXEL released two new models of Internet-modems. The ZyXEL Omni56K and ZyXEL Omni56K+ were replaced with two new-comers — ZyXEL Omni 56K NEO and ZyXEL Omni 56K DUO. They say that the model's name "DUO" means "two" in Italian, that is why the junior model should be called "UNO" instead of "NEO" ;). However, let's take a closer look at both solutions and find out whether the company managed to correct the flaws we mentioned in the previous review. At first glance, the difference in technical characteristics of the old and new models of the Omni56K line is inconsiderable - the only change that catches my eye is improvement in the linear part. Besides, we shouldn't underestimate efforts of the designers: till recently modem makers didn't show anything extraordinary in this direction. The first idea I think of when I look at this model is that this is a CD player! Besides, dimensions of the modems (depth and width) are very close to those of a usual CD caddy. It provides an advantage: unlike old models, the greater height doesn't allow the modem to knock back because of weight of the cables connected to its back. Like before, there are 4 indicators — "MR", "DATA", "OH", "HS", with the DUO model having one LED for the USB connection. Small rubber legs make the modem stand steadily. Functions of the connectors located on the back are written below. Since the back panel is not wide the connectors are located too close to each other but this doesn't prevent connecting them. In this test we used the microprogram 1.0. The modems ship in nice glossy boxes of different colors - orange for the DUO models and cherry for the NEO; the models differ in the color of a plastic cover which is blue for the DUO and green for the NEO. The box contains everything we might need for installation of the modem — a power unit (9V/AC,1A), an RS-232 cable (and a USB cable for the DUO model), and an RJ-11 telephone cable. A small booklet offers a brief installation manual. The advanced users will be pleased with a PDF manual coming on the CD with detailed description of all instructions and registers of the modem and some statistics of connections with explanation of parameters. The CD supplied has about 30 useful utilities: WEB browsers, FTP clients, programs for operation with IP telephony, Dialers and many other things. There is also Venta Zvoice program (5.0) which always comes with ZyXEL modems - it allows working with an automatic number identifier, fax and voice functions. As you can see, the color semitransparent cover with the model's name can be taken off. But I don't think it's because there are removable covers of different colors, just because of convenient production. The modems were tested under the MS Windows XP, and taking into account problems faced by owners of old models when using USB connection, we paid special attention to it. 18:14:18.315 — Hanging up the modem. 18:14:18.315 — Hardware hangup by lowering DTR. 18:14:28.309 — A timeout has expired waiting to comm event to occour. not drop CD with in 10 seconds, Attempting software hangup. 18:14:38.313 — A timeout has expired waiting to comm event to occour. Note that there were no problems in case of connection to COM ports. During the two-week test we came across the following problem several times — the operating system hang in course of disconnection ignoring the mouse also USB connected (Logitech BD69, Windows XP integrated drivers). But the problem was solved in half a minute. At the same time, when the modem was connected through the COM port we got no problems, which implies that the drivers for USB still need improvement. Like the predecessors, the new modems easily establish connection using the V.90 protocol (provided that the line quality and Internet provider's equipment allow for it). We found no considerable changes from the old modems, and the microprogram of the NEO/DUO modems has minimal alterations as well. The new modems have the same instructions and capabilities for gathering statistics as the previous series. Unfortunately, one small bug in operation of the modem wasn't corrected yet — if in course of the connection establishment the output signal level is equal to or higher than -5dB the connection fails. We couldn't check operation of the Power Drop function as well (on the V.34 protocol) by request of the remote modem with setting the 7th bit of the S92 register. However, this problem can be caused by a peculiar functioning of the remote modem which doesn't check whether the service function of Power Drop request is supported by a local modem. The new modems from ZyXEL use the well-known transformer-less analog part on the SiLabs Si3034 chipset. At first glance I noticed no improvements in the circuitry of the linear part as far as input circuit overvoltage protection is concerned (as compared with the ZyXEL Omni 56K and Omni56K+ modems). That is why we still should follow the recommendations for operation with modems based on the transformer-less linear circuit, i.e. not to ignore earthing of the computer unit. The built-in speaker hasn't undergone any changes as well - there is the same miniature buzzer. The printed-circuit boards of the modems are standard - the layout is the same for both PCBs. The elements are located on only one side of the PCB: the increased size allows for it and it is cheaper in production. The DUO modem's board has two mechanical relays and the NEO has one relay meant for commutation of an additional telephone because this model doesn't support recording of voice messages from a telephone. It should be noted that the problem found in Omni 56K modems (with an additional telephone connected a number was dialed incorrectly) was solved in the NEO and DUO solutions. In the new modems the telephone is disconnected before dialing. It is pleasant that the relay for disconnection of an additional telephone works quite noiselessly, the sound of commutation is rather nice, and there is no resonant clicks. The board uses a 8 Mbit flash memory chip used in the previous line, which provides some reserve of 512 Kb for further extension of the microprogram and addition of new functions. So, the new ZyXEL modems are very similar to the previous Omni 56K and Omni 56K+, but for the new case, altered layout of the PCB, corrected errors in operation with an additional telephone connected, noiseless dialing, and with the same retail price which was announced with the release of the Omni 56K modems. So, if you planned to get Internet-modems of the Omni 56K or Omni 56K+ series the new ZyXEL Omni 56K NEO and ZyXEL Omni 56K DUO will be excellent substitutes.